I always feel like November is The Darkest Month™. Why? I don’t know. I guess transitioning from light to darkness seems to move in a pretty blunt way instead of smoothly, especially here in Atlanta. It went from hot to cold in a snap and I’m sure it will get hot again out of nowhere before it gets cold again. I should be used to it by now, I’ve been here almost 30 years! But no, I will never get used to erratic Georgia weather. How was your October? Did anything reveal itself beyond the veil? Did you listen to your intuition and take some much needed time for self-care? Not gonna lie – I didn’t and now I’m suffering a bit with a sinus thing but I did have some beyond the veil revelations that were quite beautiful. How has September treated you? September’s message in the Nine of Wands hit me pretty hard that month. The phrase that kept coming up for me was “Be kind, for everyone you meet is fighting a hard battle” – myself included. If anything, September’s message was that of resilience and courage. Where did you find your resilience and courage? How will that transition us into October? It’s September and you know what that means? Kelly-Ann Maddox is having Self-Love September! If you haven’t followed SLS, please check it out on her YouTube and Soundcloud. You will not be disappointed! The journey of self-love is very important to me and I’m really excited about what is coming this month, not only with SLS but with this month’s card. What do Self-Love September and our September card have in common? Quite a bit, actually! Summer is almost over and I think this morning, I felt the tiniest hint of Fall in the air, believe it or not! how is your year going so far? Mine is a whirlwind of chaos, indecision, and renewed passion for certain aspects of my life that needed a pick-me-up in the best way possible. How about you? 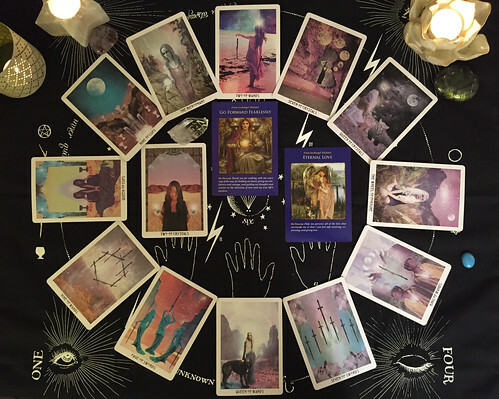 Did last month’s Queen of Wands light the way? She certainly did for me! What fun things does August have in store? Oh, July, July already?! I hope the year is treating you well so far! How was your June? My friendly reminder for self-care came in pretty hard, as evidenced in my Root Chakra check in. Gotta love the tough love, right? June’s tough love taught me a lot. How about you? Is there more tough love in store for July? Let’s find out! Here we go again! Another month gone. How was your May? Did you follow the Kings of Wands fire? It led me down some interesting paths, if I’m being totally honest. That Wands fire: always illuminating, always passionate, always fiery. Holding on to that fire, let’s find out what June holds.